If you are at ease with your cat playing with your belongings, then by all means, let cats be cats. As long as it’s safe, cats truly enjoy fiddling with anything at home they deem interesting. 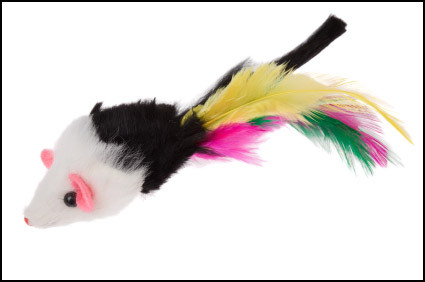 You can even be crafty and save a few dollars by making some handy toys to keep your cat busy – anything with feathers, jingles, and string are perfect for their play time. If purchasing from a pet store, buying little stuffed mice, laser lights, and the ever-liked Kong are ideal. Occasionally spraying the toys with liquid catnip (if your cat responds to catnip) is also a great way to get them started playing with the toy. Whatever the toys you get, be sure they are completely safe. And keep in mind that like children, cats too get bored of their ‘new toys’ and often go back to playing with off limit items. To reduce this tendency, take the toys away when the cat is finished playing with them.